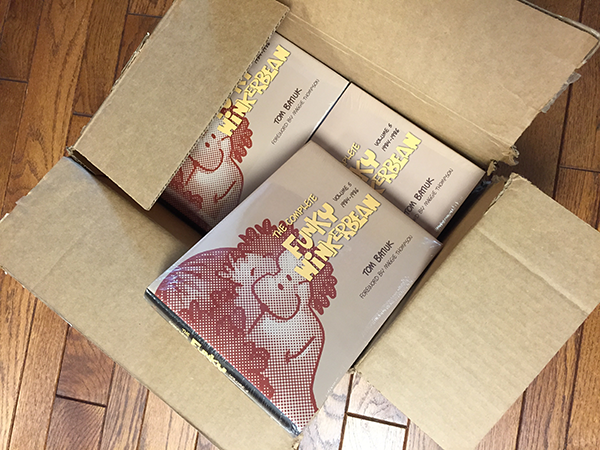 A box containing the latest volume of the ongoing Funky codex arrived the other day. After all of the hard work on everyone’s part in putting these together, first in the studio here, and later at the Kent State University Press, it’s always nice to sit down with a new edition, cuddle it like a newborn and check out what’s inside. This particular volume marks the point where the strip begins to grow up and start moving toward more adult and substantive work. As I say in the intro to a brace of very special books that The Press will be bringing out next year, if Lisa’s Story is where the storm front broke, then this collection is where the first drops begin to appear on the windshield. If you want to check it out for yourself, just go to the books section on this site. Happy summer reading.